AtlasBI - Getting Started — Atlas Systems, Inc.
AtlasBI is a real-time business intelligence and reporting analytics system for your Atlas products. It provides fast, intuitive, graphic-based reporting tailored to your needs. This cloud-based solution links directly to your Atlas hosted server without any additional setup required by you - everything is handled by Atlas. You will receive your unique URL in an email from Atlas Systems Support (support@atlas-sys.com). If you do not receive an email, please contact Atlas support. To log in, enter the same credentials you use to access the product (Aeon, Ares) client. You need Staff Manager and Customization Manager access in order to log into the AtlasBI system for the first time. Once you've logged in, you'll be able to add other users and set permissions for them. Users must be in your Aeon or Ares system to access the reports. 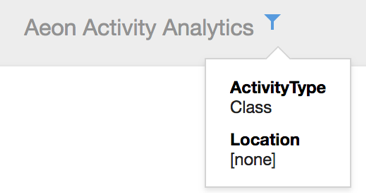 Permissions levels that can be assigned are Administrator, Contributor, View, or None. Most dashboards default to showing items form the last year (365 days). You can change the results to only show items for the most recent X days by clicking on the Dashboard Parameters icon in the top right. The timeline of items in the results is displayed in a date range filter showing items by date. This timeline will only show items based on the “Last X Days” parameter. You can click and drag the timeline to change the range. 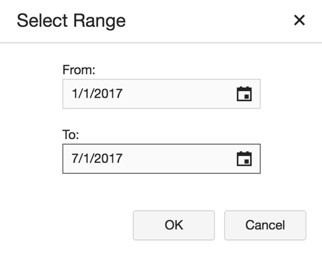 Additionally, you can click the icon on the range filter itself that looks like two flags and specify begin and end dates by typing them in. For any grid, pie chart or tree map (multi-colored boxes sized by amount), you can click on a section/row to narrow the results. The default is to only select one item at a time, but you can choose the button in the top right of the box that looks like stacked checkboxes to turn on multi-select. Once you have chosen a filter, you can clear that filter by clicking the filter icon with a red X in the top right of the chart/grid. If you only filter one chart/grid by one item, that filter will display next to the dashboard title. Once you click more than one, the text changes to a blue filter icon. Hovering on that icon will list all the filters. You can click on the headers of any grid to sort the results by that field. The first click will sort ascending and the second click will sort descending. An arrow will display in the field header showing the sort order and direction. You can also right-click on the header of any column to sort ascending, descending, or clear sorting for that column. If the grid contains more data than will fit on the screen, a scroll bar doesn’t display but scroll functionality works as expected. In the top right of the dashboard is an icon to export the results. The options are PDF, Image, or Excel. Clicking the option brings up a dialog box of settings before exporting. Detailed help for both the viewing and editing systems in AtlasBI are available directly from within the AtlasBI system by clicking the red help ? in the upper right corner of the page. You can review some of the reports that are provided for Aeon on the AtlasBI Sample Reports - Aeon page. Atlas is always here to help! Contact support@atlas-sys.com if you have any questions about AtlasBI or need help in getting it up and running.